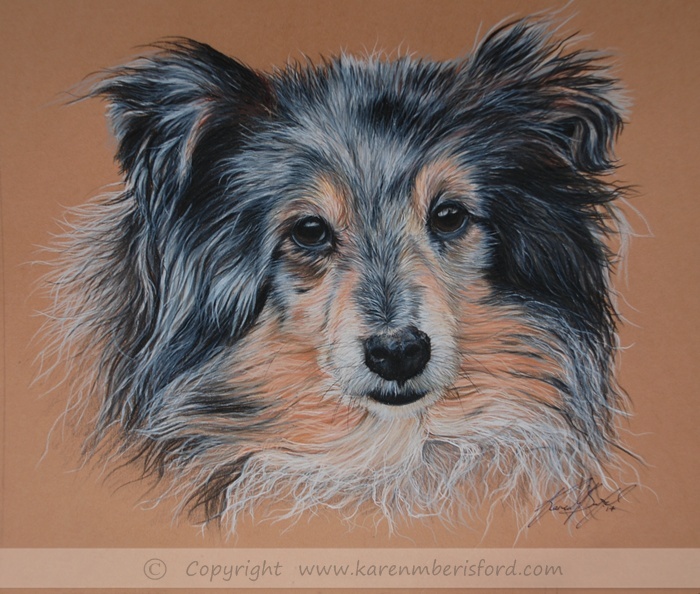 This beautiful little Shetland Sheepdog called Sam, was part of a trio of portraits all produced in Coloured pencils. I went up to meet him and his 2 sisters and took my camera so I could capture some quality photographs and spend some time with them to get an idea of their characters. Sam's eyesight had sadly deteriorated over a period of time and he could not see well and so was uncomfortable with a stranger trying to take photographs of him, so I stepped back and took what I could without stressing him too much. Sam passed away, age 15 on the 3rd February 2014 and so this portrait is extra special to the owners who said it was " a lasting memory and fitting tribute to a wonderful dog who gave them so much"
Sam's eyes on the photographs I had taken had a milky white effect to them and so it was decided to recreate the beautiful dark eyes he had before he became partially blind. This was relatively easy using photographs of the 2 girls with those lovely dark eyes too. As the photos had been taken at a distance, the quality of detail was lacking but the Commissionee supplied me with a few photos of their own which were far better and I took the detail and colour from those to ensure the final portrait was just right.